Acts 2:38 is the Biblical account of the initial outpouring of the Holy Ghost on Jewish believers in Jesus Christ. Here in Acts chapter eleven Peter recounts how the Gentiles believers in the Jewish Messiah also received the “gift” of the Holy Ghost. Peter referred to the Old Testament prophet Joel’s (Joel 2:28-29) prophecy when he said, “But this is that which was spoken by the prophet Joel; And it shall come to pass in the last days, saith God, I will pour out of my Spirit upon all flesh: and your sons and your daughters shall prophesy, and your young men shall see visions, and your old men shall dream dreams: And on my servants and on my handmaidens I will pour out in those days of my Spirit; and they shall prophesy:” (Acts 2:16-18). The “Comforter” has arrived! We do not need to wait and hope any longer. The “Comforter” was another term that Jesus used to describe God’s Spirit residing in believers. When our hearts are right, we will receive the Holy Ghost because it has already been poured out. The “Comforter” has arrived! However, what is a “comforter”? The word “comforter” implies that the Lord will soothe us in distress and sorrow. He will comfort us in our grief, bringing consolation and hope. When believers are in trouble, He encourages and helps us. Notice in John 14:16-18 that Jesus prays to the Father that He will give them another “Comforter.” This “Comforter” is the “Spirit of truth” which dwells in each believer. Jesus then tells them that He is the “Comforter”. It is Jesus that comes to us. The Holy Ghost is both a seal or mark of God’s ownership of our lives and a guarantee that of our inheritance in Christ. This Holy Ghost is the anointing of God in our lives. As a child of God, we have an inheritance until the redemption. We have been purchased, but with a price. The precious blood of Jesus. “And because ye are sons, God hath sent forth the Spirit of his Son into your hearts, crying, Abba, Father” (Galatians 4:6). Can a believer be saved without receiving God’s Spirit in their lives? Is the gift of the Holy Ghost essential for salvation? Many believe that the baptism of the Holy Ghost is an “added blessing”. They believe that if you receive Him, well and good; if not, you can still be saved without Him. The Holy Ghost is God’s presence. This Spirit Baptism provides the inner transformation. It equips every believer for living in this world. The Holy Ghost brings us rest, peace and joy. Romans 14:17 says that “the kingdom of God is not meat and drink; but righteousness, and peace, and joy in the Holy Ghost.” The Holy Ghost helps us to pray. Yes the Spirit of God helps us to pray. Romans 8:26-27 (KJV) – “Likewise the Spirit also helpeth our infirmities: for we know not what we should pray for as we ought: but the Spirit itself maketh intercession for us with groanings which cannot be uttered. And he that searcheth the hearts knoweth what is the mind of the Spirit, because he maketh intercession for the saints according to the will of God. The Holy Ghost gives us the power to witness. We see a drastic change in the disciples following the initial outpouring of the Holy Ghost. 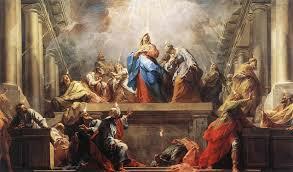 Prior to the day of Pentecost they were fearful and frustrated. However, after receiving the baptism of the Holy Ghost we see these same men become bold and fearless. The Holy Ghost is a teacher. It is our guide that shows us things to come. We need God’s Spirit operating in our lives to enable us to understand correctly and interpret God’s word. The Holy Ghost is indeed a teacher. God has a “gift” for all of us. The “gift of the Holy Ghost”. The Spirit baptism is the “promise of the Father”. It is also the seal of the New Covenant. The gift of the Holy Ghost is a doorway that leads us into a deeper walk with the Lord. I want to receive all of God’s gifts – don’t you? This was the fourth and final article in a series on the plan of salvation. The first article was entitled Salvation – the Gospel. The second article was entitled Repent and Believe the Gospel. The third article was entitled Water Baptism – Burial. God’s Land Promise to ABRAHAM – Fulfilled? Nice finish, Ron. I enjoyed the series.